Whip the whipped cream in a mixer or with a whisk (if your strong and quick) till it has firm peaks. Add the Caramel Baileys a little at a time till it reaches your desired taste. In a small shallow dish, mix the chocolate and coarse sugar. Dip a glass lightly in water and then dip in the sugar/chocolate mixture. If it doesn't want to stick well, try simple syrup or honey. 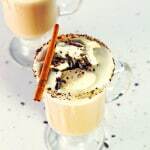 Next make your strong coffee and add the Vanilla Cinnamon Baileys and Frangelico. Give it a stir. Top your drink with some whipped cream and sprinkle with some chocolate if you like. Add a cinnamon stick and serve!